File consists of two (2) artifacts from the 175th Port Hope Fall Fair, 15-17 Sep 2006. It includes: (1) Port Hope Fair 175th Anniversary Button; (2) "Show and Shine" Car Show Card. Fonds consists of correspondence, newspaper clippings and manuscripts dated 1926-1958 and 2009 related to the life of Alexander Geerardt Mörzer Bruyns. Original deeds, mortgages and other documents relating to Lot 11, Concession 3, Yarmouth Township, 1816-1907. 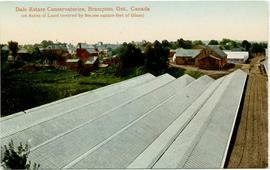 Item consists of a photographic postcard of an elevated view of the Dale Estate greenhouses. Verso includes "Published by Mrs. Edwards, Brampton, Ont." Item consists of a photographic postcard of an elevated view of the Dale Estate greenhouses. Three other segments, cut from the postcard before arriving at the archives, exist in the Richard J. Frost postcard collection. The Valentine & Sons' Publishing Co., Ltd. Item consists of a photographic postcard of an elevated view of the Dale Estate greenhouses. Dale Estate Office, Brampton, Ont. Canada. Item consists of a photographic postcard of the office of Dale Estate. Dale Estate, Carnation Houses, Brampton, Ont. Item consists of a postcard with a black and white photograph and a colour illustration, reading "From the land of the maple". Item consists of a photographic postcard of an elevated view of the Dale Estate greenhouses. Postally used from Toronto, but the year is unreadable.